AFTER READING THE WARRANTY BELOW MAKE SURE YOU REGISTER YOUR EGG. A valid proof of purchase receipt from an Authorized Dealer will be required to make a Warranty claim. For Warranty support, contact the Authorized Dealer from which the item was purchased. You may contact any Authorized Dealer if the EGG was purchased within the United States. For EGGs purchased in countries outside the United States, Warranty claims are handled by an Authorized Dealer or Distributor in the country of purchase. Please refer to the INTERNATIONAL section of the BGE website at BigGreenEgg.com to locate the Authorized BGE International Distributor in your particular region. Warranty claims must be made through an Authorized Dealer or Distributor within the original country of purchase. Warranty for Residential Use: Each Big Green Egg® ceramic cooker (XXLarge, XLarge, Large, Medium, Small, MiniMax and Mini) used as a residential (non-commercial) ceramic cooker carries a Limited Lifetime Warranty for materials and workmanship on all ceramic components (including dome, base, damper top, fire box and fire ring) to the original purchaser or owner who has purchased the EGG from an Authorized Dealer, and has registered their Warranty as required (the “Residential Warranty”). This Warranty is valid for as long as the original purchaser owns the EGG®. The warranty for residential use of other ceramic, metal and wood components or EGGcessories are covered as explained below. This warranty is in addition to and does not affect your statutory rights which may apply. Warranty for Commercial Use:Each Big Green Egg® ceramic cooker (XXLarge, XLarge, Large, Medium, Small, MiniMax and Mini) used in a commercial setting is warranted to free from defects in materials and workmanship under normal and reasonable commercial use for a period of one (1) year from the date of purchase to the original purchaser or owner who purchased the product from an Authorized Dealer and registered their Warranty as required (the “Commercial Warranty”). This one (1) year Commercial Warranty covers all parts of the EGG including without limitation, the ceramic dome and base, and all other ceramic, metal and wood components from manufacturing, workmanship or materials defects. This warranty does not apply to EGGs used in mobile or pop-up restaurants, or within food trucks or other mobile cooking kitchens. This warranty is in addition to and does not affect your statutory rights which may apply. 2. OTHER CERAMIC PRODUCTS: (For Residential Users Only. Does not apply to Commercial Use.) The Big Green Egg brand of convEGGtor and Ceramic Pizza/Baking Stones carry a Limited Three (3) Year Warranty to the original residential purchaser. These ceramic components are not covered for breakage or cracks from dropping, improper storage, misuse or abuse. 3. METAL COMPONENTS: (For Residential Users Only) METAL COMPONENTS: Metal, Stainless Steel and Cast Iron components of the EGG (including the metal bands, hinge mechanism, cooking grid, fire grate, upper vent cap and lower draft door) carry a Limited Five (5) Year Structural Integrity Warranty to the original purchaser. The Big Green Egg makes every effort to utilize materials that resist rust and to apply high temperature coatings on metal surfaces. However, metal materials and protective coatings can be compromised by surface scratches or exposure to substances and conditions beyond BGE’s control. Among other things, chemicals, chlorine, industrial fumes, fertilizers, extreme humidity, lawn pesticides, trinidad moruga scorpion peppers and sodium chloride are some of the substances that can corrode paint and finish on metal coatings. For these reasons, the Warranty on Metal, Stainless Steel and Cast Iron Components DOES NOT COVER RUST, OXIDATION, FADING, DISCOLORING, BLEMISHES or REPLACEMENT DUE TO ADJUSTMENT OR ALIGNMENT OF PARTS OR COMPONENTS, unless it also results in a loss of structural integrity or a failure of these components of the EGG. Band and Hinge alignment and adjustment support is available from an Authorized Dealer. 4. WOOD and COMPOSITE COMPONENTS: For Residential Users Only) Wood EGG Mates, High Density Composite EGG Mates and Genuine BGE Hardwood Tables carry a Limited One (1) Year Warranty to the original purchaser. Only genuine BGE Mates and Tables are covered under this Warranty – please be certain the Tables or Mates you purchase are BGE branded products as third-party products are not covered under the BGE Warranty even if sold by a BGE Dealer. BGE Mates and Hardwood Tables are not covered for cosmetic or coloring changes, weathering or cracks unless there is also a loss of structural integrity. Please follow recommended care guidelines to maintain appearance of wood products. CAUTION NOTICE: DO NOT place an EGG directly on or near a combustible surface, deck, table or other flammable base without the use of a BGE Metal Nest or Metal Table Nest, or without making use of other fireproof barrier such as a 2” non-porous concrete block under the EGG. Failure to safely support the EGG will void the Warranty and BGE EXPRESSLY DISCLAIMS ANY LIABILITY FOR ANY DIRECT, INDIRECT, INCIDENTAL OR CONSEQUENTIAL DAMAGE WHICH MAY RESULT. Do not attempt to use a Table Nest to support an EGG unless the EGG is actually housed within a table, island or other surround. The low-profile Table Nest is not designed as a free-standing support for your EGG! Only the Mini and MiniMax have a low-profile Nest designed to be used as a free-standing base. IMPORTANT – See Getting Started and Safety Tips at BigGreenEgg.com. Commercial Users. See the Safety Tips and User’s Manual for Commercial User requirements and recommendations. NOTE: The BGE metal Cooking Islands are designed to support an EGG on the metal platform without the use of a Table Nest or other barrier under the EGG. However, a Table Nest may be used to raise the height of the EGG for personal preferences. 5. TEMPERATURE GAUGE AND GASKET: Gaskets and the Temperature Gauge carry a Limited One (1) Year Warranty to the original purchaser. 6. MISCELLANEOUS: Other BGE components such as the BGE Cooking Island or BGE accessories purchased from an Authorized Big Green Egg Dealer may also carry various warranties – please check the specific item for details. 7. WHAT IS NOT COVERED: Warranty does not apply to any incidental losses or accidental damage or breakage, or for any damage caused by: transporting; dropping; misassembly; improperly supporting; attempting to suspend the EGG by any means other than an approved BGE Nest or solid, non-combustible surface under the base; commercial use (other than as provided for within this BGE Warranty); modifications; alterations; negligence; abuse; improper care; road hazards; normal and reasonable wear and tear; floods, storms or natural disasters. Warranty coverage does not extend to scratches, dents, chips, crazing, fading, appearances or minor cosmetic cracks of the exterior glaze that does not affect the performance or structural integrity of the EGG. BIG GREEN EGGS AND RELATED BGE PRODUCTS PURCHASED FROM UNAUTHORIZED RESELLERS, UNAUTHORIZED THIRD PARTIES OR THROUGH UNAUTHORIZED RETAIL CHANNELS SUCH AS DISCOUNT CLUBS AND DISCOUNT CHAIN STORES ARE NOT COVERED UNDER THE BIG GREEN EGG WARRANTY. 8. DATE OF COVERAGE: The Warranty coverage begins when an EGG is purchased from an Authorized Dealer and is registered at BigGreenEgg.com by the original purchaser or owner as required under this Warranty. If you are unable to register your EGG at the website, an Authorized Dealer can provide a form to complete and mail to BGE. 9. COVERAGE UNDER THE WARRANTY: Original BGE components that are found to have defects in materials or workmanship, and that are covered under a valid and registered Warranty, will be replaced or repaired at the sole discretion of BGE at no cost for the warranted item or component, subject to the terms and conditions of this Warranty. Any Warranty claim must include an accurate description of the problem or visual evidence of the defective part. 10. WARRANTY CLAIM PROCEDURE: A valid proof of purchase receipt from an Authorized Dealer will be required to make a Warranty claim. For Warranty support, contact the Authorized Dealer from which the item was purchased. 11. INFORMATION REQUIRED FOR CLAIM: A Valid Proof of Purchase is required. A purchase receipt showing date of purchase and name of Authorized Dealer from which the EGG or other BGE product was purchased must be provided with any Warranty claim. For Warranty purposes, an original purchaser is the person whose name appears on the purchase receipt, or is in possession of an original purchase receipt, and who has registered their BGE Warranty as required. 12. SHIPPING AND DELIVERY: BGE is not liable for shipping, delivery charges, labor, packaging costs, export/import duties, VAT or any levied taxes resulting from any Warranty claim, service, repair or return, unless authorized in advance in writing by BGE. 13. VOIDING THE WARRANTY: Any unauthorized modifications or alterations to an EGG will void the Warranty. This includes using any parts inside the EGG other than authentic BGE components; drilling holes or tampering with any of the parts; or using any internal components in any way other than as intended by the manufacturer. Modifying or substituting any internal components, including the fire grate and fire ring, will void the Warranty, and BGE expressly disclaims any liability for any direct, indirect, incidental or consequential damage which may result. The pouring of lighter fluids or any flammable mixture onto or into an EGG will void the Warranty. This practice is dangerous and may result in damage or injury. Please see Safety Tips at BigGreenEgg.com. 14. DELAY OR DEFAULT: The Big Green Egg shall not be liable for any delay or default in BGE’s performance under the Warranty caused by any event or contingency beyond the control of BGE, including, without limitation, acts of God, war, government restrictions or restraints, strikes, fire, floods, transportation delays or reduced supply of materials. 15. LIMITATIONS: This Limited Warranty is non-transferable. There are no other warranties, express or implied, except as specifically stated in this Warranty or as may be provided for under statutory rights which vary from state to state and country to country. 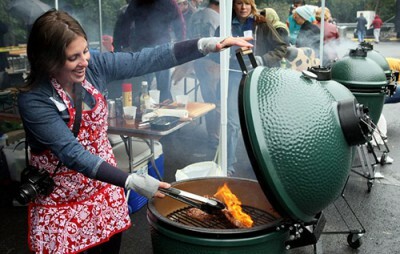 The Big Green Egg does not authorize any person or representative to make or assume for BGE any obligation or liability in connection with the sale of any EGG or BGE product. Warranties, whether written, oral, expressed or implied, are not extended to persons who obtain the product from any source other than the Big Green Egg or from an Authorized Big Green Egg Distributor or Dealer, or through an authorized BGE promotion. Purchasing and/or accepting delivery of any BGE product from unauthorized dealers or online resellers will void the Warranty associated with that product. The Big Green Egg is not sold at discount clubs, discount chain stores, online or by e-commerce stores, and any product purchased from any such retailer is not covered under Warranty. Authorized Dealers can be located or verified at the BigGreenEgg.com website. 16. BGE’s OBLIGATIONS: The repair or replacement of parts in the manner and for the period of time stipulated hereunder shall constitute the fulfillment of all Warranty obligations and/or any direct and derivative liabilities of the Big Green Egg. A purchaser’s exclusive remedy for any breach of this Warranty or of any other implied Warranty is limited as outlined herein to replacement or repair of the component, shipped to purchaser at purchaser’s expense. 17. LIMITATIONS: TO THE MAXIMUM EXTENT ALLOWED BY LAW, ALL STATUTORY, EXPRESSED OR IMPLIED WARRANTIES, INCLUDING THE IMPLIED WARRANTIES OF MERCHANTABILITY AND FITNESS FOR A PARTICULAR PURPOSE, SHALL NOT EXTEND BEYOND THIS WARRANTY. LIABILITY FOR INCIDENTAL, SPECIAL AND CONSEQUENTIAL DAMAGES IS EXCLUDED. Some states and/or countries do not allow exclusion or limitation of incidental or consequential damages, so the above limitations or exclusions may not apply to you. 18. REGISTER THE WARRANTY: Warranty registration is available at BigGreenEgg.com. Failure to register the EGG at BigGreenEgg.com, or to register your purchase by other means that may be made available by BGE, will invalidate your Warranty. If you require a printed form to mail in, please see any Authorized Dealer or Distributor. The Warranties as specified herein contain all your specific legal rights under the Big Green Egg Limited Lifetime Warranty. However, you may have other rights which vary from state to state and country to country. 19. HEADINGS: The headings used in this Warranty are for convenience only, and shall not alter the terms of the Warranty. 20. International Distributors of BGE products may provide translations of the Warranty or portions of the Warranty in other languages for convenience – however, only the English version is valid, and in the event of any dispute or questions about coverage, only the English version will be considered. 21. Please see Safety Tips and First Timer Tips on this website if assembling or using an EGG for the first time. Thank you for choosing a Big Green Egg – we know you will enjoy The Ultimate Cooking Experience, and we are here along with our Authorized Dealer network to stand behind you with unmatched customer service and warranty support. Effective 2018. ©COPYRIGHT BIG GREEN EGG INC. ALL RIGHTS RESERVED. Big Green Egg®, EGG®, the Green color®, EGGcessories®, The Ultimate Cooking Experience®, EGGheads®, MiniMaxEGG®, EGG Mates®, Nest®, EGGniter® and convEGGtor® are Trademarks or Registered Trademarks of the Big Green Egg Inc.